at Verily was putting sensors on a contact lens to measure glucose levels for people living with diabetes to better manage their disease. We partnered with Alcon, Novartis’ eye-care division, in 2014 to leverage the team’s expertise in lens development and manufacturing. Their appetite for innovation set us off on an ambitious mission to turn an object used daily by millions of people into a cutting edge medical device. The Smart Lens program has evolved into a versatile electronics platform that can support actions, like sensing and transmitting data, on the eye. We have developed methods to integrate wireless electronics and miniaturized sensors into a contact lens and built thousands of lenses in numerous form factors. Up to this point, we have directed the electronics platform at three different areas of care. In addition to the original glucose-sensing lens, we have been working on a smart accommodating contact lens for presbyopia and a smart intraocular lens for improving sight following cataract surgery. Along the way, we have performed many clinical study sessions with individual users, collecting hundreds of thousands of biological data points from on-eye readings. Our clinical work on the glucose-sensing lens demonstrated that there was insufficient consistency in our measurements of the correlation between tear glucose and blood glucose concentrations to support the requirements of a medical device. In part, this was associated with the challenges of obtaining reliable tear glucose readings in the complex on-eye environment. For example, we found that interference from biomolecules in tears resulted in challenges in obtaining accurate glucose readings from the small quantities of glucose in the tear film. In addition, our clinical studies have demonstrated challenges in achieving the steady state conditions necessary for reliable tear glucose readings. We are at a point where we have decided, together with Alcon, to put the glucose-sensing lens work on hold, while continuing to focus on the smart accommodating contact lens and smart intraocular lens projects. We remain committed to improving the lives of people with diabetes including through improved methods for inexpensive and unobtrusive glucose sensing to support diabetes management. We are working closely with Dexcom to develop miniaturized continuous glucose monitors and with Onduo, our joint venture with Sanofi, to integrate continuous sensing into the care paradigm for people living with Type 2 diabetes. We’re looking forward to the next phase of development on our other two Smart Lens programs with Alcon, where we are applying our significant technical learnings and achievements to prevalent conditions in ophthalmology. 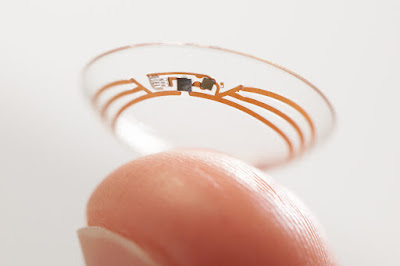 One of the first projects at Verily was putting sensors on a contact lens to measure glucose levels for people living with diabetes to better manage their disease. We partnered with Alcon, Novartis’ eye-care division, in 2014 to leverage the team’s expertise in lens development and manufacturing. Their appetite for innovation set us off on an ambitious mission to turn an object used daily by millions of people into a cutting edge medical device.